Color takes a little courage--but look at the payoff! This unused Dining Room is now a multi purpose space with style. We saved the buffet from the Dining Room set when transforming this room. It will always have a place in this family home. A family room update for social butterflies in Chapel Hill, NC--it's easy to entertain here, but also cozy for quiet evenings at home. The family-friendly Gathering Room off the Kitchen is the heart of this busy Mooresville, NC home. Accessories and lighting make a room feel warm and friendly. Every piece of furniture is family friendly, yet looks refined. Do accent pillows have an impact? We think they do! 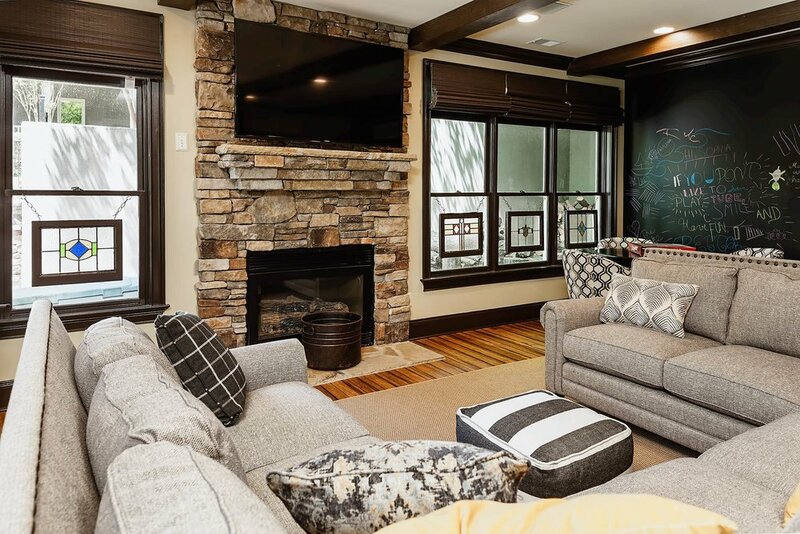 This Raleigh Family Room shows that neutral colors don't have to be boring! Accessories add interest and comfort to a neutral chair. 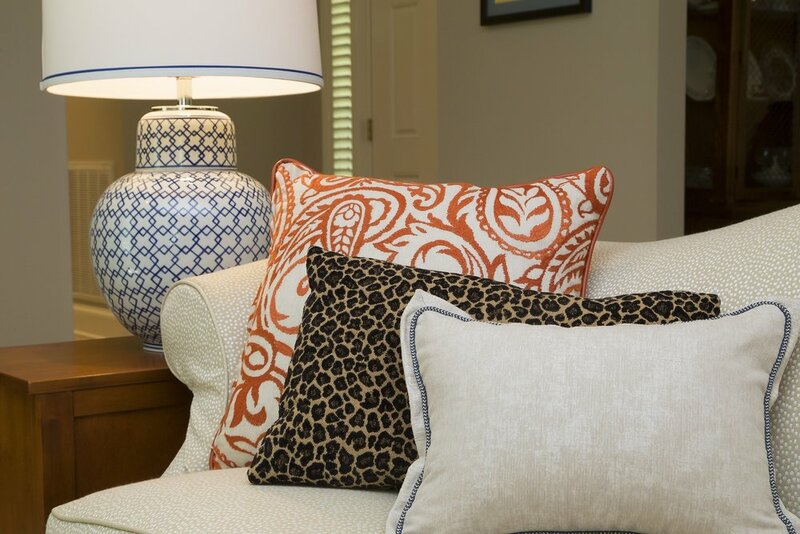 Use accent pillows in a mix of patterns and display meaningful objects on bookshelves to create an inviting room. Would you believe that this is the basement? Now it's a room that can be used every day by all ages! 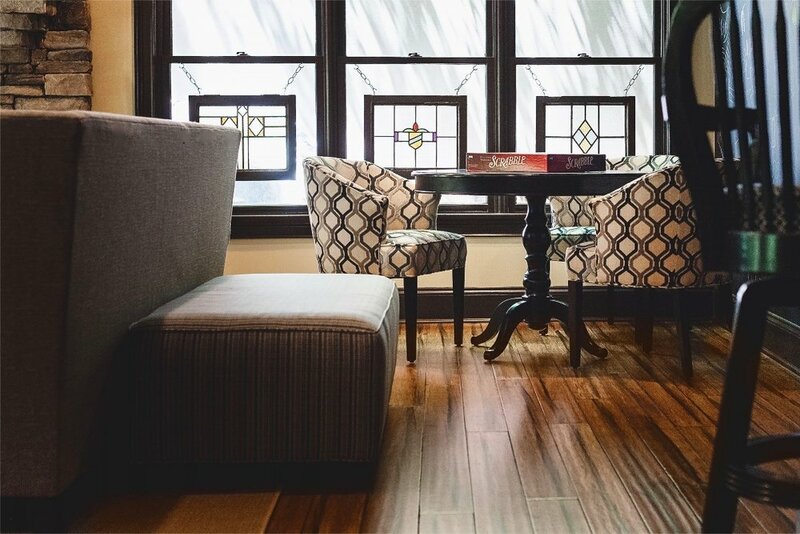 A corner of the beautiful room makes it possible to play games, serve snacks or have a private conversation. These curtains do a fantastic job of framing a lake view! 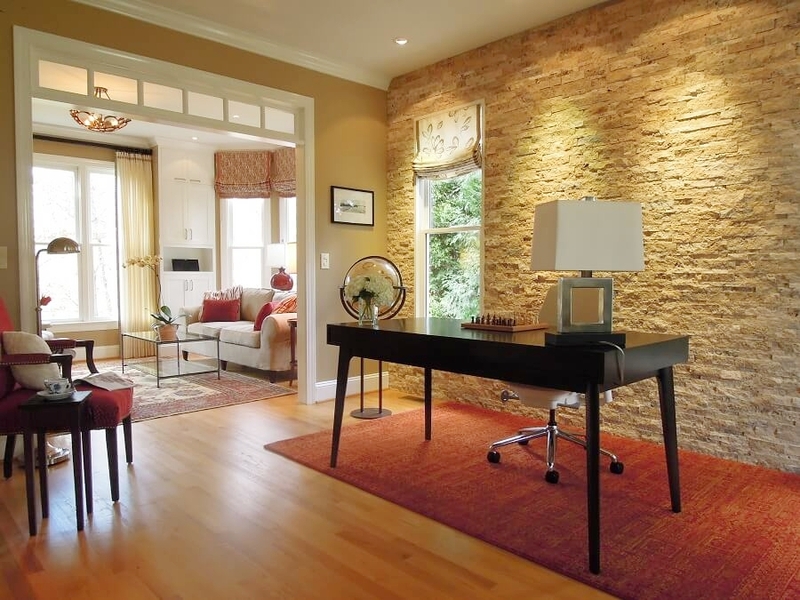 An accent wall of stacked travertine stone adds sparkle and texture to this gorgeous home office in Chapel Hill, NC. Custom shelving with LED accent lighting displays a collection of carved wood shore birds and keeps favorite books organized. 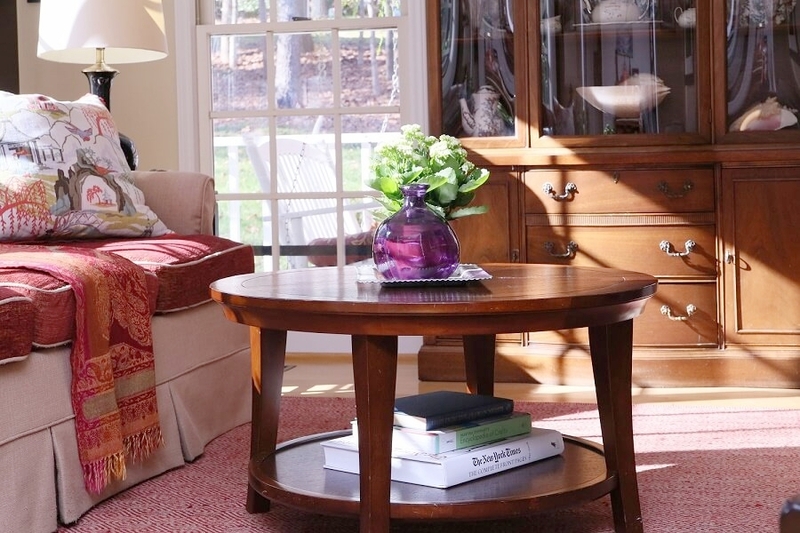 This room in Chapel Hill became a favorite retreat for the grown-ups in the house. Pet friendly upholstery fabric was used in this Living Room! 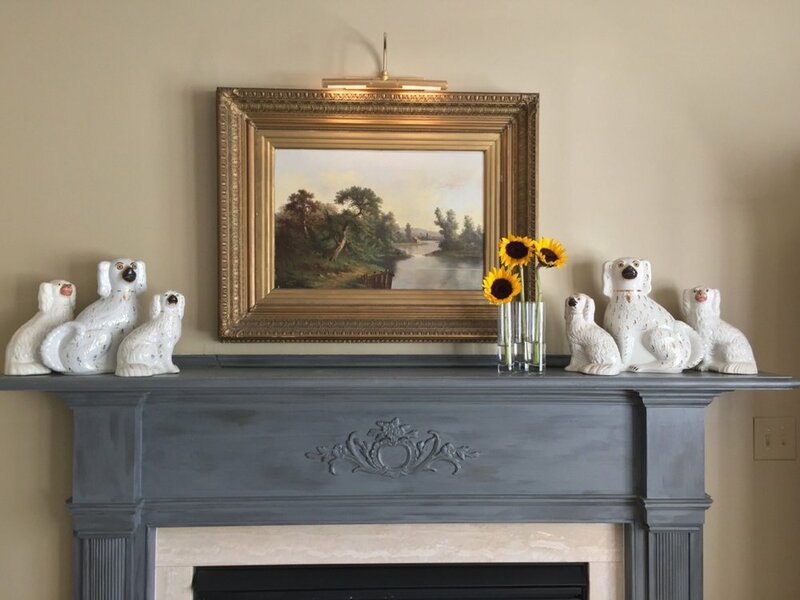 Original artwork and a special collection atop a fireplace mantel with a custom finish, painted by a local artist. This Raleigh Family Room with a coffered ceiling, LED lighting and a big sectional sofa is in constant use by family and friends. A neutral upholstery fabric on the sectional sofa was livened up with accent pillows. A leather ottoman adds extra seating or a place to kick up your feet. The right word on an accent pillow can remind you about the purpose of a comfortable sofa. This low maintenance (i.e. fake) dog stands guard in a handsome foyer. Neutral furnishings work well with colorful trim, accessories and local artwork. A Dining Room in Chapel Hill that was rarely used became a sitting room that is enjoyed every day. This Great Room is perfect for entertaining or just snuggling with the kids. The Master Bath in this Raleigh home was completely remodeled. Two vanities, separate water closet, freestanding tub and large shower with rain showerhead make it one fabulous room. 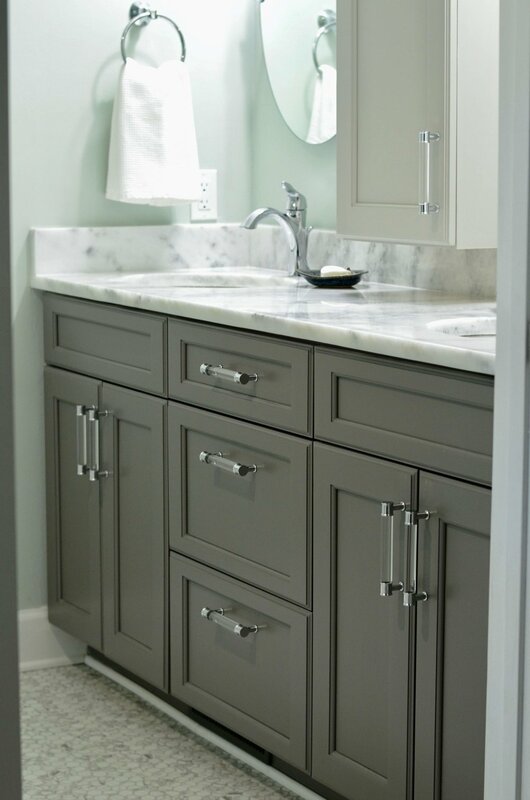 Bathroom renovations in older homes usually provide higher counters, more storage and upgraded finishes that make starting and ending the day much more pleasant! Navy blue cabinets are just plain fun to look at! And very handsome! And look at that floor! The freestanding tub sits in front of a large--but very private--window,overlooking a pool and beautiful wooded lot. An old boxed in shower is now light and bright. This Powder Room received attention from the floor to the ceiling. Stone tiles! Copper trim! Splashes of color! A soothing aqua wall and bedding color—with accents of purple and white— freshened up this Master Bedroom suite. Artwork definitely belongs in the bedroom, but it doesn’t have to hang directly over the headboard! This eat-in Kitchen was updated to reflect the Raleigh homeowners favorite color palette of blue and brown. Calm, soft and inviting! The Kitchen corner desk is warmed up with a custom window treatment and has views into both the back garden and the gorgeous Family Room. By adding new light fixtures over the large granite island and LED bulbs in the recessed cans, this Raleigh Kitchen absolutely sparkles. This Kitchen was transformed without changing the footprint or the solid surface counters. New cabinets, tile backsplash, appliances and fresh color palette did the trick at an affordable price. Taking cabinets all the way up makes a HUGE difference in an older home with 8 foot ceilings. This Master Bedroom update was wonderful. We really took it from drab to fab! The right color palette makes all the difference in the world. 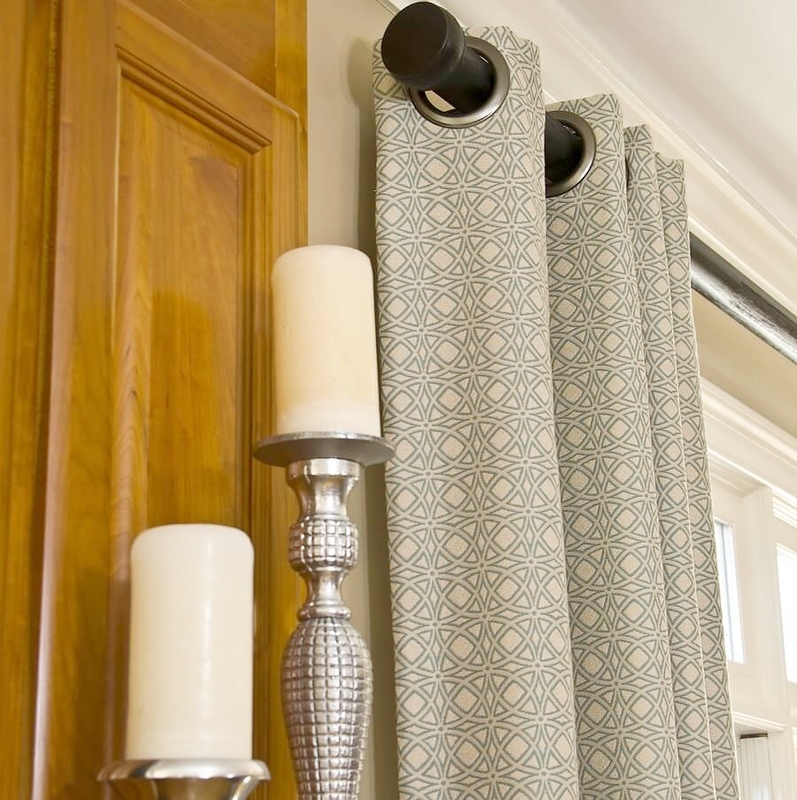 The biggest bang for your buck will always be custom window treatments. Just a few strong details are all this Dining Room needs! This little dog has the right idea - take advantage of the sunlight. Glass accessories and plants add sparkle and life to this Raleigh Living Room. Details - every room needs thoughtful details! Mixing patterns gives a room depth and interest. In this Raleigh Home Office, I slip-covered two old wing chairs, then layered on accent pillows and a throw. Presto chango! Ceiling fans have changed--for the better. Clean lines coordinate well with any style of home decor. Use your family or found antiques. Don't hide your treasures. Use different fabrics to create a stunning custom design. This houndstooth upholstery fabric on an existing club chair brings a smile to all who enter the room. It's got personality! Nothing needs to match--things just need to play well together. Window treatments can vary in style in the same room. This Chapel Hill Family Room is proof! I encourage my clients to purchase original artwork and I help them find the perfect spot to display it in. Use accessories with a little sparkle, fabric with pattern and warm wood tones to create rooms that instantly feel comfortable and inviting. Use pieces that remind you of travel, hobbies or people!